FIRST CLASS is a travel class on some passenger airliners intended to be more luxurious than business class, premium economy, and economy class. 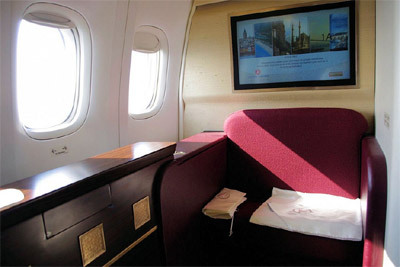 On a passenger jetliner, first class usually refers to a limited number (rarely more than 20) of seats or cabins toward the front of the aircraft which have more space, comfort, service, and privacy. In general, first class is the highest class offered, although some airlines have branded their new products as above first class. Propeller airliners often had first class in the rear, away from the noise of the rotating propeller. With business class seating moving upmarket, some airlines are modelling their first-class section as SUITES. 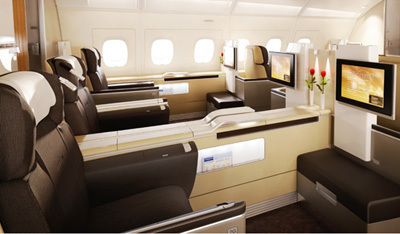 Singapore Airlines now markets its highest class on its A380s as "suites", with the tagline "A class above first." The 2 m (78 inches) bed is separate from the seat and folds out from the back wall, with several other components of the suite lowering to accommodate the mattress. 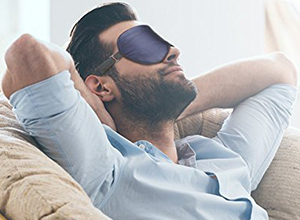 Windows are built into the doors and blinds offer privacy. Suites located in the center can form a double bed after the privacy blinds between them are retracted into the ceiling. 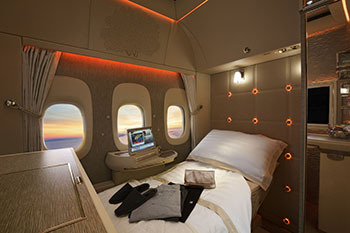 Other A380 operators like Emirates also have a suite-like first class with similar amenities but the bed and chair are integrated where a button is pushed to turn the seat into a bed in seconds and vice versa. 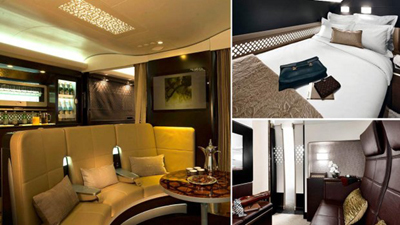 Etihad Airways introduced a three-room suite called "The Residence" in December 2014 when it added the Airbus A380 to its fleet. Airbus’ New Jet Concept Features Swappable Spas & Cafes - Wired. 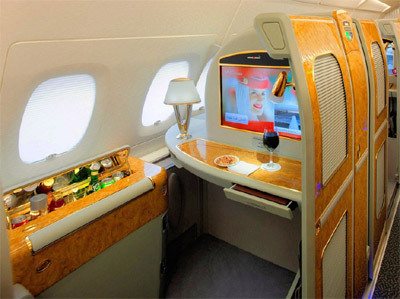 Amazing first-class air cabins - CNN. 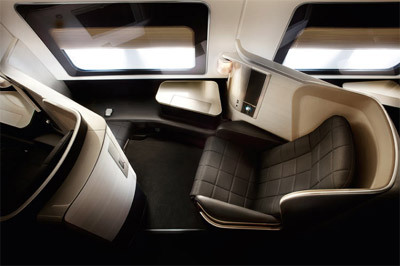 best airlines for 1st class, biz class & economy cabins - The Telegraph. First class (aviation) - Wikipedia. 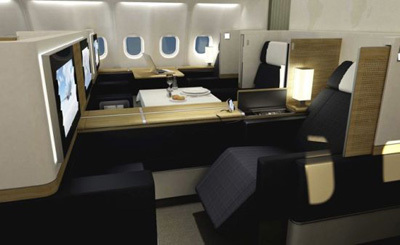 First Class and Business Class Awards to Europe with Frequent Flyer Miles - TravelSort. Game of Thrones - "How airlines woo the one per cent." Most Expensive Luxury Airline Suites - The Most Expensive Journal. 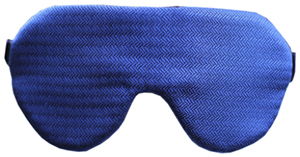 Singapore Airlines - "New Business Class." 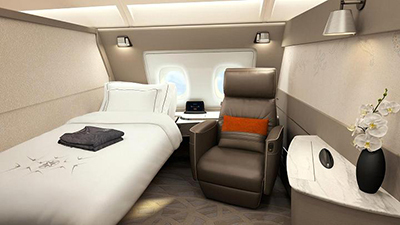 Singapore Airlines just unveiled new suites for its Airbus A380 - CNBC. Singapore Airlines Suites - "How close is too close? You’ll never have to know." The aircraft interiors of the future - The Telegraph. The best airline first-class lounges - The Telegraph. The Most Luxurious First Class Cabins - Condé Nast Traveler. 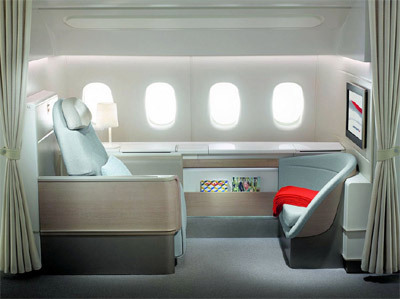 Top 10 First Class Seats 2016 - Skytrax. Worlds Best Airlines in First Class 2017 - World Airline Awards. 'Zero gravity' and private suites: Emirates' new Boeing 777 first-class cabin revealed - The Telegraph. 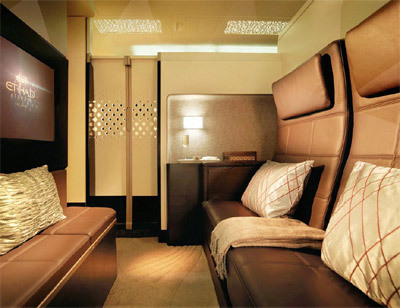 Etihad Airways "The Residence" - onboard the A380. "The world’s most luxurious living space in the air." Our pioneering spirit and traditions of hospitality, drawn from our home Abu Dhabi, have been harnessed to create contemporary living spaces in the air, and provide all guests with unparalleled comfort and service with your own living room, bathroom & bedroom. Designed for up to two guests travelling together, it has been created by leading interior designers and hospitality experts who understand the discernment and sophistication expected by the private traveller. The Residence is a haven of tranquility, reflecting an exclusive lifestyle that offers the ultimate in high-end luxury. Singapore Airlines New Suites - on board the A380 aircraft 2017. Singapore Airlines Suites - "A world of your own." 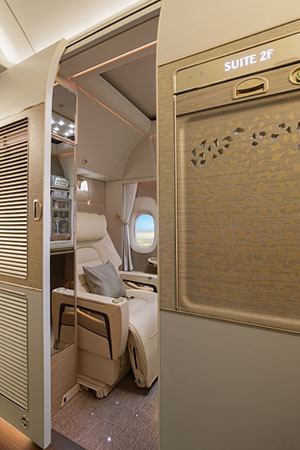 Exclusively on board the A380 aircraft, provide the distinguished few with their very own haven of tranquility. Air France La PremiÈre Suite - "A personal space tailored to your needs." 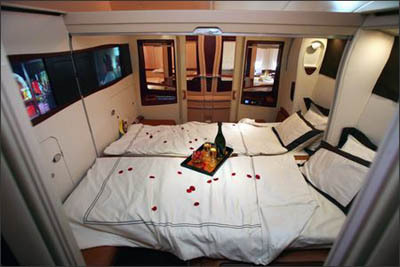 Jet Airways Boing 777 First Class - "Imagine sleeping in your own private bedroom, 40,000 feet above the ocean. 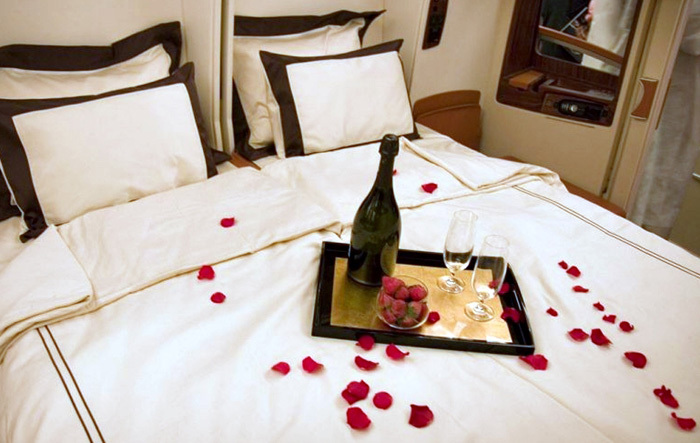 It’s not a dream - it’s the luxurious Jet Airways First Class experience!" British Airways First Suite - "Haven of style and comfort." Virgin Atlantic Upper Class Suite - " Je ne sais quoi. Defined." Lufthansa First Class - "As individual as you could wish for." American Airlines Flagship Suites - on Boeing 777-300ER. "The only true First class experience." Swiss First - "Your home above the clouds."